How did I miss this? I mean, I walk around town often enough and like to think I know Manchester quite well. I am always on the lookout for the Space Invaders that are hidden about town so I do routinely cast my eyes vertically yet I’ve come to realise that I rarely bother to look up beyond the height of say, a first floor window. The twelve metre high tower that straddles the NCP car park is Big Boys Toy by Peter Freeman. Originally installed as part of the Northern Quarter Street Festival in 1998, Freeman wanted to reflect the vibrancy of this regenerated part of town and so the piece on Tib Street transforms into a brilliant neon beacon when night falls. I actually love the colour and impact that this has when not lit; the pastel structure reminiscent of summer by the seaside even when the backdrop is more often grey clouds than blue sky. The lights were switched off for five years due to a dispute over how they would be powered and paid for, but CityCo and the NCP came to an agreement last summer and between the hours of 11pm and 1am the tower is once again lighting up the Northern Quarters. It was reading more about the artists that had contributed to the 1998 street festival which eventually led me to a rather lovely art installation located along five miles of the Lincolnshire coast. Last year, the Festival of Bathing Beauties featured a series of fifteen beach huts between Mablethorpe and Sandilands. The huts were created by the University of Lincoln and range from mini art and craft galleries and theatres through to puppet workshops. My favourite of the huts is the Victorian style camera obscura in Mablethorpe, painted red and white it stands out in spectacular fashion as if the legacy of a travelling fair from long ago. Since The Bathing Beauties were handed over to East Lindsey district council I believe the camera obscura is opened up during holidays but disappointingly, the public perception of the huts as static objects rather than interactive spaces for hire has meant that the other pieces are not being put to use. Keeping public art alive with all the cost involved is an uphill struggle, and it’s no surprise that grand ideas like the Leed’s Brick Man by Antony Gormley never live to see the light of day. The Brick Man was to be an industrious behemoth akin to the Angel of the North, originally conceived in 1986 he proposed that it would stand 180 feet high - dwarfing the Angel by some 114 feet! But even successful money generating attractions fall prey to decay or demolition; there are some wonders that we can now only imagine. 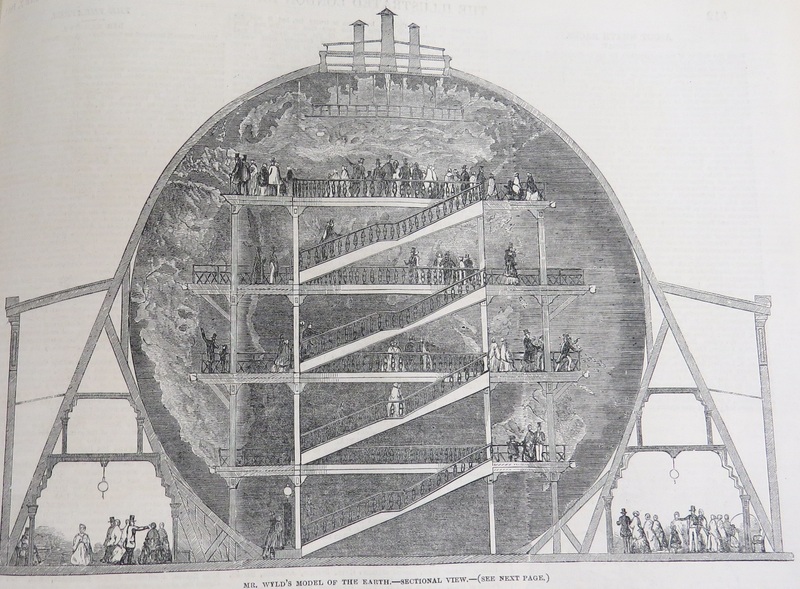 Between 1851 and 1862, in Leicester Square, you could have marvelled at, and within, Wyld’s Great Globe. The attraction was a 60 foot globe that you could climb inside; walking around the split levels whilst viewing the concave surface of the earth. It was precisely modelled to scale in plaster of Paris, mountain ranges and all. As well as being a thing of beauty and awe, the globe was also a source of exhaustive information as Wyld constantly adapted to the changing trends and discoveries of science, delivering topical lectures and producing huge visitor guides stretching to well over a hundred pages. Upon opening, the Great Globe had been one of the most popular visitor attractions in England yet within a year its footfall had dramatically waned and despite Wyld’s best efforts, when the lease was up on the land, the globe was broken up and sold for scrap.